A comprehensive review of the planning and implementation of wolf reintroduction in Central Idaho and Yellowstone National Park in 1995-96, including how the wolves were captured, released, and managed in the first months of this controversial project. The gray wolf (Canis lupus) was once distributed throughout nearly all of North America. Wolves, like other large predators in North America, were persecuted shortly after colonization by Europeans began and throughout the settlement period. Gradually wolves were extirpated from the contiguous 48 states except Minnesota. The desirability of retaining remnant populations in large tracts of land in the western United States was debated even as the last wolves were being eliminated by the U.S. Biological Survey....However, in the early 1900's, there were fewer wolf supporters than opponents, and the species was eradicated in the western United States, even in national parks. By about 1930, wolf populations had disappeared from Montana, Idaho, and Wyoming. A few wolves, apparently long-range dispersers from Canadian populations, were periodically killed, because wolves did not receive significant legal protection until 1974. Reproduction did not resume in the western United States until 1986, when wolves denned in Montana. If any one occasion could be singled out as the beginning of organized efforts to restore wolves to Yellowstone National Park (YNP) and central Idaho, it probably would be an interagency meeting held in October 1971 in YNP. In response to an increase in reported sightings of wolves, local resource managers met to discuss how to deal with a population believed to exist at low density in the area of YNP northward to the Canadian border. Subsequent field work indicated no wolf population existed there....A recovery plan, initiated in 1974, recommended that natural dispersal and reintroduction be used to restore wolves. A revised and more specific plan recommended (1) promotion of natural recovery in northwestern Montana, (2) reintroduction of wolves designated "nonessential experimental" in YNP and, (3) other measures (presumably reintroduction) would be instigated in central Idaho if 2 breeding pairs had not naturally established there by 1992. The recovery goal was 10 breeding pairs of wolves in each of the 3 areas for 3 successive years. Achievement of this goal would be followed by removal of the gray wolf from [Endangered Species Act] ESA protection in the northern Rocky Mountains of the United States. A reexamination of these recovery goals by the USFWS suggested that they would lead to the establishment of a viable metapopulation of wolves in the northern Rockies, with interchange between the 3 subpopulations, as well as between the United States and Canada. The final EIS was completed in 1994....Regulations were developed to reintroduce about 15 wolves to Idaho and YNP annually for 3-5 years. All reintroduced wolves as well as other wolves found in the experimental areas after the first release would be designated as members of "nonessential experimental populations" under section 10(j) of the ESA. Some opponents and proponents of wolf restoration immediately attempted, via litigation, to prevent implementation of the reintroduction plan. Opponents believed wolves would cause undue hardship to agricultural interests and disrupt local lifestyles. Proponents believed wolves already existed or would soon naturally recolonize these areas and that wolves and wolf habitat deserved more protection than the rules afforded them. Reintroductions were conducted despite several court-ordered delays. ....Throughout the period of planning and implementing reintroductions the wolf population in northwestern Montana was increasing. By August 1996 about 8-10 breeding pairs of wolves (80-100 individuals) occupied the area resulting from natural recolonization that began in the early 1980s. The Idaho primary analysis area (where wolf packs will most likely persist and have impacts; Fig. 1) is about 53,900 square kilometers of rugged mountainous terrain, including almost 16,200 square kilometers of designated Wilderness (Table 1). It supports 241,000 wild ungulates, including mule deer (Odocoileus bemionus) and white-tailed deer (O. virginianus), elk (Cervus elaphus), mountain goats (Oreamnos americanus), bighorn sheep (Ovis canadensis), and moose (Alces alces). The annual hunter harvest is about 33,360 ungulates. Mountain lions (Puma concolor), black bears (Ursus americanus), and coyotes (Canis latrans) are abundant. About 17,666 square kilometers (32%) of the federal land is seasonally grazed by more than 300,000 livestock (Table 1). Livestock are also abundant throughout the year on adjacent private lands. Annual livestock losses average about 12,310 cattle and 9,260 sheep. The human population is about 92,400 residents....The area receives about 8 million recreational visits annually (Table 1). The YNP primary analysis area (Fig. 1) is about 64,800 square kilometers of mountainous terrain (Table 1). It has more than 95,000 wild ungulates including elk, mule and white-tailed deer, moose, bighorn sheep, bison (Bison bison), pronghorn antelope (Antilocapra americana) and mountain goats. Hunters annually harvest more than 14,300 ungulates. Black bears, grizzly bears (Ursus arctos), mountain lions and coyotes are common. Federal land is seasonally grazed by more than 410,000 livestock (Table 1). Within this area, at least 30,400 square kilometers of public land, including YNP, has no livestock grazing. Livestock are abundant throughout the year on private lands. Annual livestock losses from all causes average about 8,340 cattle and 12,990 sheep. The local human population is about 288,000 residents....Some 14.5 million recreational visits are made to the area annually (Table 1). ....The EIS projected growth of the wolf population based on the following assumptions. Fifteen wolves would be reintroduced annually in each area beginning in the late fall of 1994. Only 2/3 of those released would contribute to population growth because 1/3 would disappear (fate unknown) or move outside the recovery areas. Every year 10% of the wolves remaining within the recovery area would be removed in agency control actions, and another 10% would die from various causes. Pups would first be produced in the spring of 1996 when 2 litters with 5 pups each (the average litter size in northwestern Montana) would survive. These parameters resulted in estimates of 14 wolves by late fall 1996 in each reintroduction area. After 4 years of reintroductions we assumed the wolf population would grow at 22% annually (the population growth rate for wolves in northwestern Montana). The population would reach a minimum of 10 breeding pairs in each of the 3 recovery areas for 3 successive years and be removed from ESA protection by 2002. The EIS predicted that a recovered wolf population (10 breeding pairs or about 100 wolves) in Idaho would kill 10 cattle, 57 sheep and about 1,600 wilf ungulates, primarily deer, annually (Table 2). Wolf predation would reduce harvest of female elk by 10-15%. Hunter harvest of male elk, deer, moose, bighorn sheep, and mountain goats would not be affected. Wolf presence would not change uses of public or private land except for use of toxicants for predator control. Visitor use would likely increase 8% for out-of-area residents and 2% for local residents but economic benefits were not estimated. Annual economic losses as a result of wolf predation were anticipated because of fewer hunter benefits (what hunters reported that hunting female elk was worth to them), because of reduced hunter expenditures...and because of livestock losses (Table 2). The EIS predicted a recovered wolf population in the YNP area would kill 19 cattle, 68 sheep, and about 1,200 wild ungulates, primarily elk, annually. Wolf predation would reduce populations of elk 5-30% in some herds, deer 3-19%, moose 7-13%, and bison 15% or less. This would not affect hunter harvest of male ungulates but would reduce harvest of female elk, deer, and moose. Harvest of bighorn sheep, mountain goats, and antelopes would not be affected. Wolves would not change use of public or private lands except for limited use of predator toxicants....Economic losses from wolf predation would result from fewer hunter benefits, reduced hunter expenditures, and livestock losses. Surveys indicated that the presence of wolves would make YNP a more attractive location for visitors. More people and longer stays would generate an additional $23 million in the local economy annually (Table 2). Opinions of experts on release protocols varied drastically. Some supported a quick (hard) release, in which wolves would be captured, transported, and immediately released with a minimum of holding, handling, and expense. Wolves released in this manner would separate and travel widely, generally in the direction from which they had come, but would not be able to reach home. Most would survive and some would pair-bond and establish packs. To mimic natural dispersal patterns, unrelated young adult wolves were preferred for quick release. Litigation in November 1994 set the reintroduction schedule back by several weeks. While a court order prevented wolves from being transported into the United States, project biologists and local fur-trappers east of Jasper National Park in Alberta captured wolves in modified neck snares. These wolves were examined, radiocollared, and released on site in November and December. On 3 January 1995 the court order was lifted. Wolves were then captured by an interagency team of about 15 biologists, public affairs specialists, and veterinarians from Alberta Environmental Protection, USFWS, NPS, U.S. Department of Agriculture Animal Damage Control, National Biological Service, Alaska Department of Fish and Game, Wyoming Game and Fish Department, Idaho Department of Fish and Game, and fixed-wing aircraft and helicopter pilots under contract to the USFWS. Private conservation groups also provided volunteers and funding. Wolves scheduled for reintroduction during the second year were captured in British Columbia. In late November 1995, biologists from the British Columbia Ministry of Environment, Lands, and Parks, Wildlife Program, began to helicopter-dart, radiocollar, and release wolves in an area north of Fort St. John, British Columbia. The 1996 reintroduction began 16 January and ended on 27 January, during which time 53 wolves were handled. The only mortality occurred when a caged male wolf bit a biologist's thumb and was euthanized, as required by public health protocol....Congressional cuts to the USFWS wolf recovery program were made expressly to prohibit the 1996 reintroduction. Private conservation groups...responded by providing about $100,000 to fund cooperative agreements with British Columbia and for aircraft support and other services, without which the project would not have proceeded. In January 1995, 7 males and 8 females were released into Idaho....Weather and a court order delayed the first releases, causing the wolves to spend nearly 90 hours in their shipping boxes. In all subsequent releases, wolves spent [less than] 24 hours in shipping boxes. Meanwhile in YNP, 3 groups of 6, 5, and 3 wolves (9 M, 5 F) were each placed in separate pens that had been constructed near a maintained highway in the northern part of YNP. These wolves were fed road-killed ungulates until the pens were opened in late March....The delay in capture of wolves in Canada, when added to the planned acclimation period of 8 weeks, meant that YNP wolves were in captivity during the breeding season, despite efforts to avoid this. All wolves were monitored using standard radio-telemetry techniques. No wolf moved outside the experimental area in which it was released. Wolves reintroduced in Idaho traveled widely and generally northward, but most remained on public land within the core reintroduction area. Four Idaho wolves died: 1 was illegally shot, 1 was killed by a mountain lion; 1 was accidentally killed during an agency wolf-control action; and 1 death is being investigated. One wolf has not been found since March 1995 but 30 others are being monitored. No pups were born in 1995. Movement patterns suggest that 8 pairs...might be raising pups in 1996, but at this time only 3 litters can be confirmed....As of 1 August 1996 we estimated that [31 or more] adults and [40 or less] pups may be in Idaho. 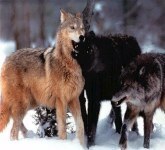 No livestock were killed by wolves in 1995, but 3 calves were killed by a wolf in June 1996. While an attempt was being made to capture that wolf, it accidentally drowned. No Idaho wolves have been captured or moved in other management actions and no land-use restrictions have been imposed. Yellowstone. ....Of the 7 groups released, all but 1 breeding pair remained together, unless a breeding member died....While most made some long range exploratory moves, all but one (it was brought back) of the intact packs returned to establish home ranges in the vicinity of their pens....Of the 31 wolves released and 23 born, 9 wolves have died. Three were illegally shot, and 2 were struck by vehicles. Two males from different 1995 packs that had denned and possibly a new-born litter from one of those packs were killed by a wolf pack released in 1996 that did not den. One male was killed by Animal Damage Control when it attacked sheep again after being moved for killing sheep. A newly released female carrying 6 fetuses died in April 1996 after being burned by a natural thermal feature....In July 1996, one 3-month-old pup was accidentally trapped and disabled in a control action. It was placed in a wildlife research and educational facility (Wildlife Science Center, Forest Lake, Minn.). Wolves released in YNP twice killed livestock outside the park. In January 1996, a 1995-released male dispersed out of YNP and killed 2 sheep 40 km north of the park; 2 other sheep were reported missing....In June and July 1996, the alpha female of the only pack that did not remain together after its release killed 8 ewes and 2 lambs 45 km northeast of YNP....In addition to the livestock attacked, one pack killed a lion-hunting dog 40 km northeast of YNP in December 1995....Compensation was paid for lost livestock and for expected weight loss in 7 lambs that were orphaned. Compensation is not paid for pets. There have been no land-use restrictions outside of YNP and virtually none inside....It was estimated that in 1995 about 4,000 YNP visitors saw or heard wolves, and in 1996 the rate of observation may be even higher. According to newspaper reports, local businesses were profiting from the growing interest in wolves. It is too early to judge which of the reintroduction approaches will result in reaching 10 breeding pairs the quickest....At this time, however, we can say that results from both approaches have exceeded expectations. In Idaho there are up to 8 breeding pairs that could produce as many as 40 pups in 1996. In addition there are [15 or less] adult wolves in the Idaho recovery area that could form additional breeding pairs and produce pups in 1997. We expect [10 or more] breeding pairs in Idaho by June 1997....In the past 18 months, only 1 of the reintroduced wolves in Idaho has attacked livestock. It was killed after it severely wounded 1 calf and killed 2 others. The producer publicly stated he would refuse any compensation because he did not approve of the wolf program. Wolf groups released into YNP tended to stay together and restrict their movements more than Idaho wolves did....Twenty three pups have been born. As of August 1996, there were 2 surviving litters from 1995 and 4 surviving litters from 1996. There are 6 existing wolf groups that could produce pups in 1997....One man who mistakenly shot a wolf immediately turned himself in, and he was fined $500. Another man who tried to avoid detection after shooting and skinning a wolf was found guilty by a local jury and sentenced to 6 months incarceration, 1 year probation, a $10,000 fine, loss of hunting privileges, and court costs. Table 2: Expected impacts of recovered wolf population (100 wolves).